All Carey needed was a defensive stop to get rolling Friday night in the Panther Homecoming eight-man football game against the unbeaten Rockland Bulldogs. They got it, and Carey (3-0) was home free—scoring six unanswered touchdowns to pile up a 68-24 victory over Rockland at Derrick Parke Memorial Field in Carey. Nine touchdowns and seven-for-nine success on two-point conversions (17-for-22 on the season) turned into Carey’s biggest offensive game in five seasons dating to 2009. Carey amassed 598 total yards. It broke down into 407 rushing yards on 40 carries, 152 passing and 56 in returns. The Panthers converted five-of-nine third-down attempts, and hurt themselves only with 75 yards in penalties. Senior Nate Adamson (422 all-purpose yards, 3 TDs, 10 TDs season) led the way and three teammates each scored two touchdowns each—junior Zach Olsen, senior co-captain Corban Johnson and senior co-captain Matt Whitworth. Yet it was defense that put gas in Carey’s tank on a cool evening. The Panthers limited a good Rockland team to just 138 rushing yards, had six quarterback sacks, blocked a punt for a touchdown and recovered three fumbles. Leading the way with 13 tackles apiece were senior co-captain Chris Peck (3 sacks), Adamson and junior Joe Parke. Junior Collin Whitby (10 tackles) pounced on two Bulldogs fumbles. Matt Whitworth blocked a punt and chased it down for a TD in his first game of the season. The teams matched touchdowns on their first possessions. Olsen dashed 11 yards around left end for an 8-0 lead. Rockland senior quarterback Rex Permann (225 all-purpose yards) pieced together a 10-play, 90-yard TD drive tying the game 8-8 late in the first. After Adamson (248 rushing yards) scored his first TD of the game on a 49-yard scamper behind Matt Whitworth’s block late in the first quarter, Carey’s defense just made up its mind that the back-and-forth TD thing wouldn’t work. 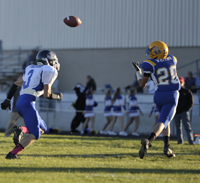 Permann brought the Bulldogs quickly to the Panther 36, where Peck broke through and made a tackle for no yardage. On the next play, Adamson came from linebacker and crushed Rockland’s Justin Robinson for a two-yard gainer. On 3rd-and-8, Whitworth flushed Permann from the pocket with a strong rush, and Parker Gamino and Adamson brought the quarterback down for just a five-yard gain. And, on 4th-and-3 from the 29, Peck sacked Rockland’s option pass attempt for a nine-yard loss. Adamson immediately connected with Joe Parke on a 51-yard pass play, and Adamson ran untouched 11 yards to paydirt for his second touchdown and a 22-8 Carey cushion. Rockland lost fumbles on its next two possessions, and Carey scored after Parke’s fumble recovery with Whitworth’s first touchdown of the season—an eight-yard ramble during which he hollered like he was wrestling down a steer. Another timely Peck quarterback sack forced the Bulldogs to punt, after which Carey swept downfield 76 yards on just five plays with Johnson’s TD making it 38-8. Rockland (2-1) suffered its first loss after 40-6 and 47-0 victories over Richfield and Camas County of Fairfield. Carey (2-0, 0-0) opens its Sawtooth Conference West Division slate Friday, Sept. 19 down the road at Richfield (2-1, 0-0). The Tigers enter the rivalry clash with a two-game win streak, 38-32 at home over North Gem and 38-0 at Shoshone after a season-opening 40-16 home loss to Rockland. Panther teams have dominated Richfield with four straight wins by a 250-42 margin. The last two Carey visits to Richfield have resulted in 62-22 and 60-6 triumphs. All six Sawtooth West Division teams will open their league slates Friday, with all eyes on the meeting between last year’s State 1A Division 2 third-place teams—Dietrich and Lighthouse Christian. Dietrich (3-0) visits 2011 state champ Lighthouse (3-0) in Twin Falls Friday—the first time Dietrich has played at the Lighthouse field. The two teams have met only once on the gridiron, Lighthouse winning 34-18 in Dietrich last fall. The Blue Devils have prevailed on the road the last two weeks 60-28 at Watersprings and 38-20 at Hagerman. Lighthouse boasts lopsided wins over Idaho City, Horseshoe Bend and Watersprings. Carey—Zach Olsen, 11-yard run (Collin Whitby, pass from Nate Adamson); 7:20 1st (8-0 C). Rockland—Rex Permann, 8-yard run (Rex Permann run); 3:36 1st (8-8). Carey—Nate Adamson, 49-yard run (Matt Whitworth run); 2:03 1st (16-8 C). Carey—Nate Adamson, 11-yard run (run failed); 11:32 2nd (22-8 C). Carey—Matt Whitworth, 8-yard run (Joe Parke, pass from Nate Adamson); 7:28 2nd (30-8 C). Carey—Corban Johnson, 1-yard run (Nate Adamson run); 4:52 2nd (38-8 C). Carey—Matt Whitworth, recovered his own punt block in the end zone (pass failed); 2:56 2nd (44-8 C). Carey—Corban Johnson, 4-yard run (Chris Peck run); 10:07 3rd (52-8 C). Rockland—Jordan Lowder, 2-yard run (Lowder run); 0:53 3rd (52-16 C). Rockland—Justin Robinson, 6-yard interception return (Rex Permann run); 0:00 3rd (52-24 C). Carey—Zach Olsen, 5-yard run (Nate Adamson run); 11:02 4th (60-24 C). Carey—Nate Adamson, 73-yard run (Alex Durtschi run); 5:57 4th (68-24 C). Rushing—Nate Adamson 13-248 (19.1 yards per carry), 6 1sts, 3 TD, 2 conv. ; Zach Olsen 11-107, 3 1sts, 2 TD; Parker Gamino 5-20, 1 1st; Matt Whitworth 3-13, 1 TD, 1 conv. ; Corban Johnson 4-7, 2 TD; Collin Whitby 1-3; Chris Peck 1-3, 1 conv. ; Alex Durtschi 1-3, 1 conv. ; DJ Parke 1-3. Passing—Nate Adamson 12-20, 149 yards, 5 1sts, 2 conv. ; Toby Whitworth 1-2, 3 yards, 1 1st, 1 interception. Receiving—Joe Parke 5-76, 1 1st, 1 conv. ; Collin Whitby 5-50, 3 1sts, 1 conv. ; Zach Olsen 1-21, 1 1st; Wyatt Thompson 1-3, 1 1st; Corban Johnson 1-2. Kickoff returns—Zach Olsen 2-11; Nate Adamson 1-25; Toby Whitworth 1-20. All-purpose yardage—Nate Adamson 422, Zach Olsen 139. Fumble recoveries (3)—Collin Whitby 2, Joe Parke 1. Punt block (1)—Matt Whitworth 1 with TD. Sacks (6)—Chris Peck 3-21; Parker Gamino 1-9; Wyatt Thompson 1-3; Collin Whitby 1-2. Tackles (77)—Nate Adamson 13, Chris Peck 13, Joe Parke 13, Collin Whitby 10, Dallin Dilworth 5, Matt Whitworth 5, Toby Whitworth 5, Parker Gamino 4, Nik D’Orazio 3, Wyatt Thompson 2, Tanner Mecham 1, DJ Parke 1, Chayton Castle 1, Alex Durtschi 1. Rushing—Rex Permann 24-103, 6 1sts, 1 TD; Justin Robinson 4-15; Jordon Lowder 3-9, 1 TD, 1 conv. ; B. Jay Turley 6-7; Tyler Rupe 1-6, 1 1st. Passing—Rex Permann 5-11, 81 yards, 3 1sts; Spencer Permann 1-4, 10 yards, 1 1st. Receiving—Justin Robinson 3-17, 1 1st; B. Jay Turley 1-56, 1 1st; Rex Permann 1-10, 1 1st; Spencer Permann 1-8, 1 1st. Kickoff returns—Rex Permann 3-31; B. Jay Turley 1-24; Justin Robinson 1-24; Cooper Bradshaw 1-6. Interceptions (1)—Justin Robinson 1 with a 6-yard TD return. Sacks (3)—Rex Permann 1-7; Preston Medinger 1-5; Spencer Permann 1-5. Tackles leaders—Spencer Permann 11, Justin Robinson 8, Rex Permann 6, Michael McClanahan 6, Preston Medinger 4, Jordon Lowder 4, Kaleb Hidalgo 3, Tyler Rupe 2, Zach Freeman 2.